Last week, she brought her credo – a simple belief in the equality of men and women in all areas of life, and on social, economic, and political levels – to bear on eating disorders. They criticize themselves. They see their body as the enemy. They try to control their lives with food. All of that poses a danger, she told the 650 women gathered for the conference. Restrictive eating, over-exercising, and other obsessive food-related behaviors not only consume time, energy, and focus, she said, they can also result in dizziness, passing out, seizures, and even death. Today, 10 million women struggle with anorexia and bulimia. Steinem emphasized that the country is facing a public health crisis — it’s not only models, dancers, and ballerinas who are affected. About 8 million people in the U.S. have been diagnosed with binge eating disorder, and many more who haven’t sought professional help. Because of treatment facilities like the Renfrew Center, Steinem said she sees a glimmer of hope for those millions who are suffering. And many are on the way to recovery. 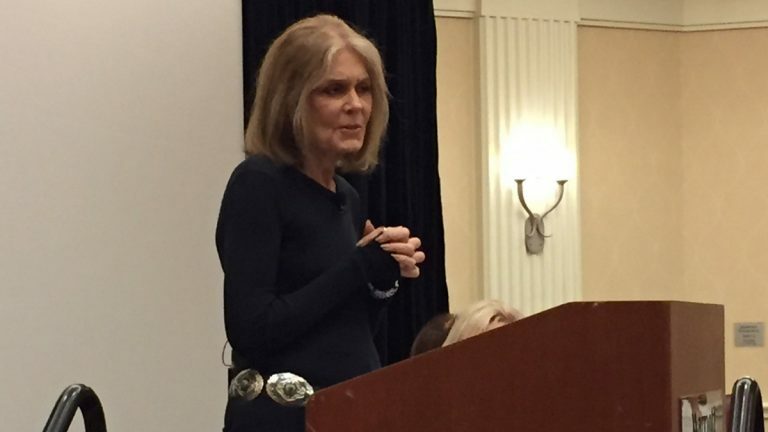 Women must fight for their self-esteem, Steinem said. They must face the mirror. They must stand up to society’s unhealthy messages about beauty. But she admitted that with mass media everywhere, those messages are difficult to ignore. “The truth will set you free, but first it will piss you off,” she said. Steinem said that although some women resist adopting the “feminist” label, many could benefit from its principles. It isn’t about thinking that women are “better” than men, Steinem said with a laugh. Feminism must empower women and men both to be free to live however they want, she said, without the restrictions or expectations of gender roles. “We are taught to believe gender roles are natural. It’s a tragedy,” Steinem said. When the Renfrew Center opened in Philadelphia in 1985, it was the country’s first residential facility to treat women with eating disorders. Since then, it’s treated more than 65,000 women and trained more than 30,000 dietitians, mental health professionals, and clinicians. Many women return to the conference year after year — including Steinem, who spoke for the third time this year. Steinem, who in 1972 co-founded Ms. Magazine — which later blossomed into the Ms. Foundation — also co-founded New York magazine, Voters for Choice, and the Women’s Media Center. She has written six books, including a biography, “Marilyn: Norma Jean,” and a memoir, “My Life on the Road,” released last week.